When Martin Boyce first came across a black-and-white photograph of concrete sculptures made by Joel and Jan Martel (Paris, 1925) modeled after trees, it was impossible to predict the strong influence this would have on his future work. Based on his analysis of their structure, Boyce developed an alphabet whose letters became a characteristic and shaping element of his work. 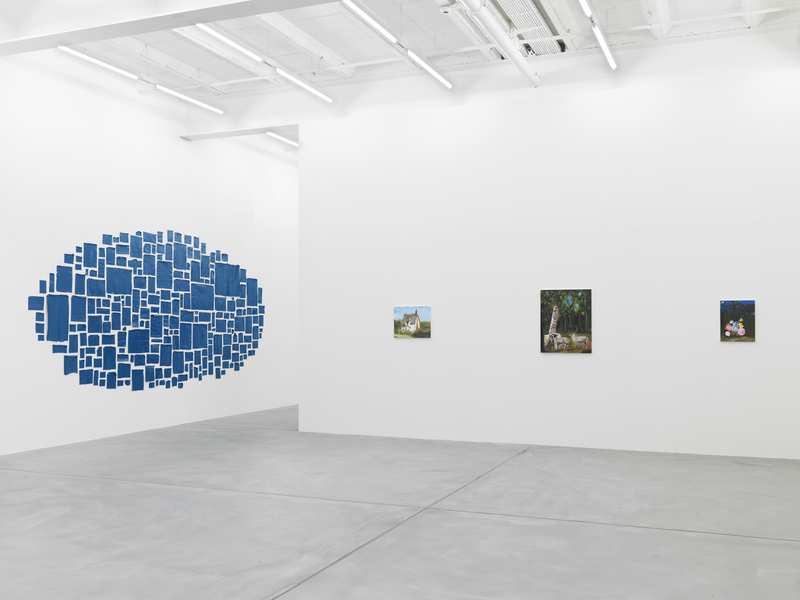 In some works, they are simply mounted on a wall, so that the eye has to trace them out, like leaves constantly changing their direction in the wind. But they also feature as elements inscribed in sculptural works, hidden in their structure. Since 2010, Boyce has been making panels cast using a concrete-like material whose surface clearly bears traces of the wooden shuttering boards. Whereas at first it was only the metal letters of Boyce’s alphabet that came together to form subtle plays of words, either literary quotations or written by the artist, they were soon accentuated by color. The work on show also combines these two elements, formulating a pictorial space that could easily be imagined stretching on into infinity. 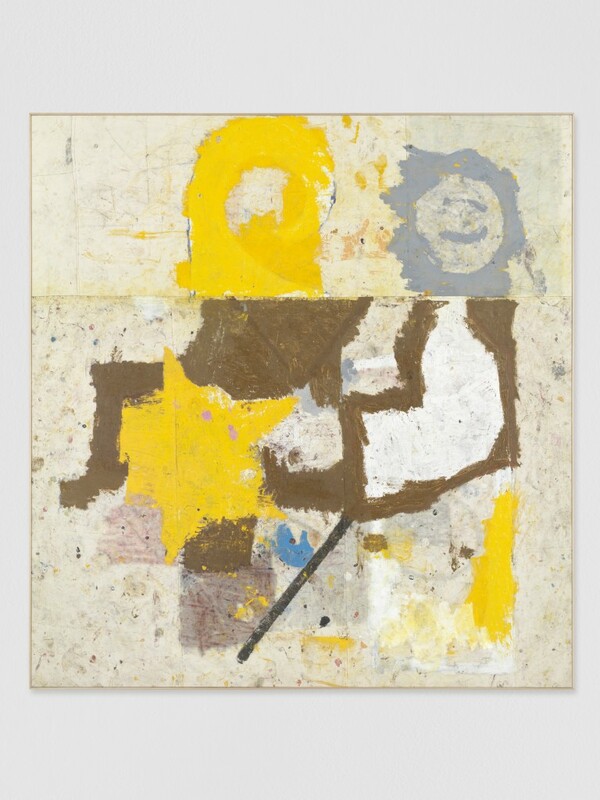 American painter Joe Bradley usually works in series, an approach that allows him to pursue specific currents in his work and then drop them once they cease to interest him. In this way, the artist creates series that vary strongly over the years, offering a surprising diversity but always retaining an unmistakable family resemblance. 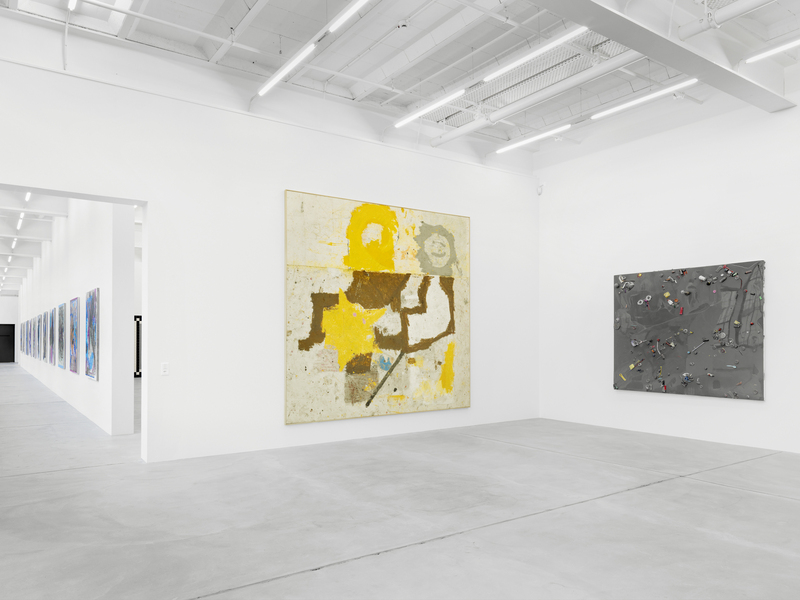 Having drawn attention at the 2008 Whitney Biennial with a group of monochrome canvases arranged into figurations, the series that followed appears as a spectacular break or turning point—in these “Schmagoo Paintings,” the colors vanish. They are gigantic pictogram-like scribbles made with grease pencil on white canvas, oscillating between figuration and abstraction in a way reminiscent of, but entirely different to the multi-panel paintings. These minimalist works dramatize universal codes and symbols (a mouth, Superman’s S logo, an arrow). Like children’s drawings, their reduced visual idiom follows the modernist impulse towards a “primitive art” but with an ironic nod to cartoons, which play a key role in Bradley’s work. In his work, Valentin Carron questions the construction of tradition and identity in a globalized consumer world. By humorously reformulating chosen symbolic objects, he exposes their authenticity as a construction. Playing on their inner tensions, symbolic objects from various cultural backgrounds are placed in a new context and presented as readymades, hybrids, or replicas made of unusual materials. The resulting sculptures are striking for both their gentle irony and their impact, questioning their own value and their mode of production and presentation. 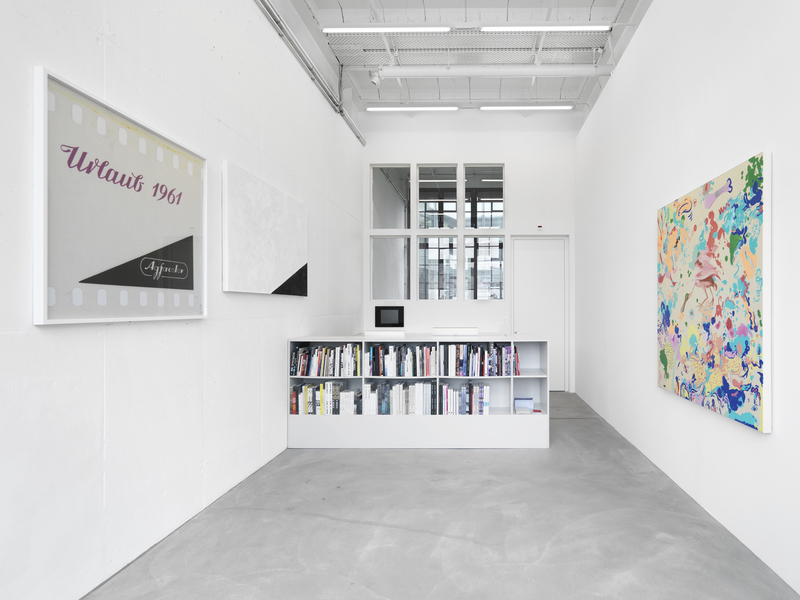 In this way, Carron’s work refers to Pop Art, Arte Povera, Fetish Finish, and Appropriation Art while creating intelligent links to the present. 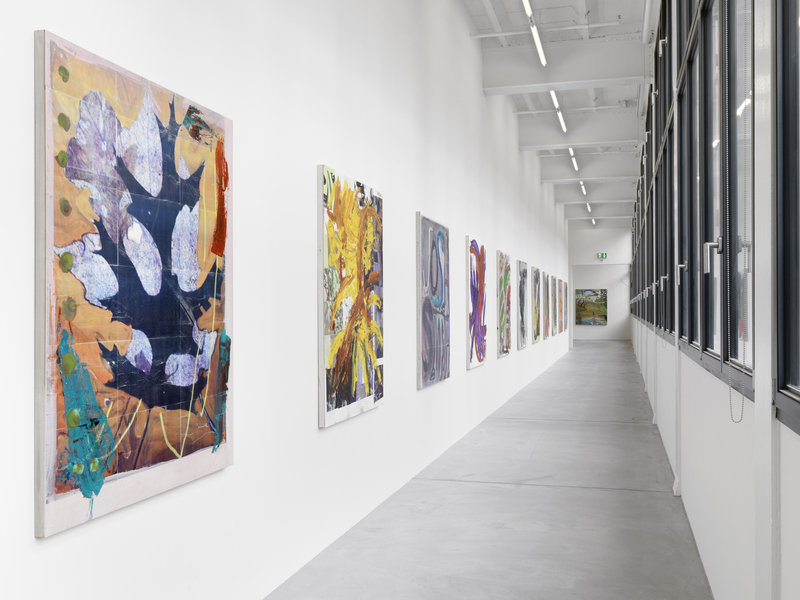 Carron’s large-format works painted onto tarpaulins using Tifelx textile printing ink, and usually stretched onto a frame of tubular steel, were first shown in his 2007 solo show at Kunsthalle Zürich. In this cycle, too, Carron concentrates on motifs from everyday life and art-historical replicas. 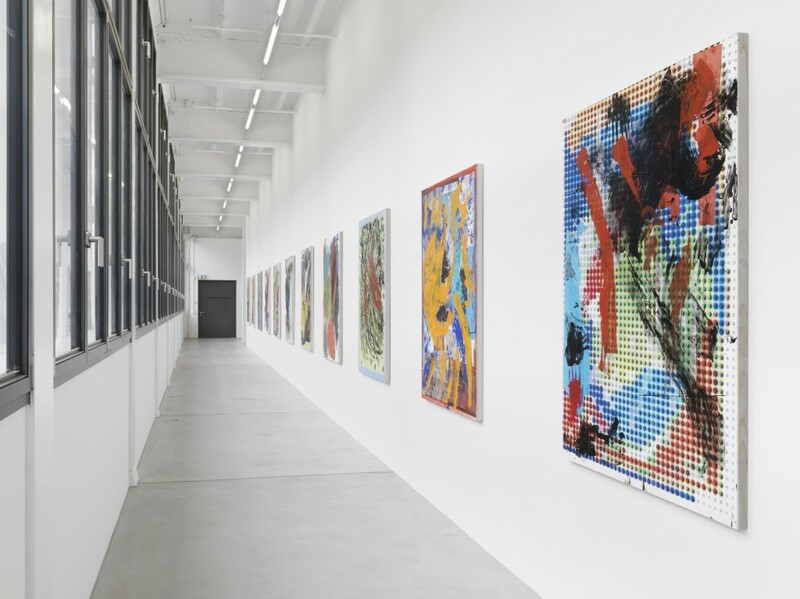 Whether he is quoting a work by Henri Matisse and awakening it to new life (Hate Eternal, 2006) or transferring a large-scale painting from the side of house in his native Martigny to a museum format (Eternamatic, 2006), the central theme is always the possibility of seeing afresh. The work on show here, Littre, is also the result of this tireless search in the realm of long-lost images. Born in 1968 in Mexico City, Abraham Cruzvillegas is known mainly for his sculptures and installations assembled out of found materials. Among other things, this approach refers to a technique seen in the poorer segments of Mexican society, where architectural and other constructions are by necessity often assembled using whatever comes to hand. The artist does not wish this approach to be understood in the sense of a do-it-yourself movement, however, since he sees a very deliberate process of aesthetic decision-making at work as a motivating force here. In some cases, Cruzvillegas takes this principle so far that he only starts looking for the materials to make a given work once he arrives in the place where it is to be shown. And he finds a whole lot, from simple pieces of wood to sheep dung. In his work, such seemingly useless, even unsightly material undergoes a peculiar revaluation. This also applies to his “Blind Self-Portraits“, a series he has been producing for several years. For these works, Cruzvillegas collects all manner of paper ephemera during a specified period of time and usually in a specific place. The tickets, city maps, menus, newspaper clippings, till receipts, etc. are then covered with a dense monochrome layer of plain emulsion paint. Rendered uniform in this way, the items in the collection are installed in cloud-like formations on the wall, grouped around an imaginary center, leaving it to the viewers to make their way through the ordered chaos. Born in 1929 in New Hampshire, Jay DeFeo moved with her family to California in 1931, where she stayed for the rest of her life with the exception of family visits in Colorado and an important 18-month stay in Europe in 1951/1952. Having graduated in art from the University of California at Berkeley, DeFeo dedicated herself wholly to art—an aim she had held since childhood. As a painter, draftswoman, sculptor, and photographer, she produced an extensive and brilliant oeuvre that continued to grow until her death in 1989. In 1958, she began work on her epic painting/sculpture “The Rose“, a major work of 20th- century art to which she devoted eight years during which it passed through various forms, dimensions, phases, and names. 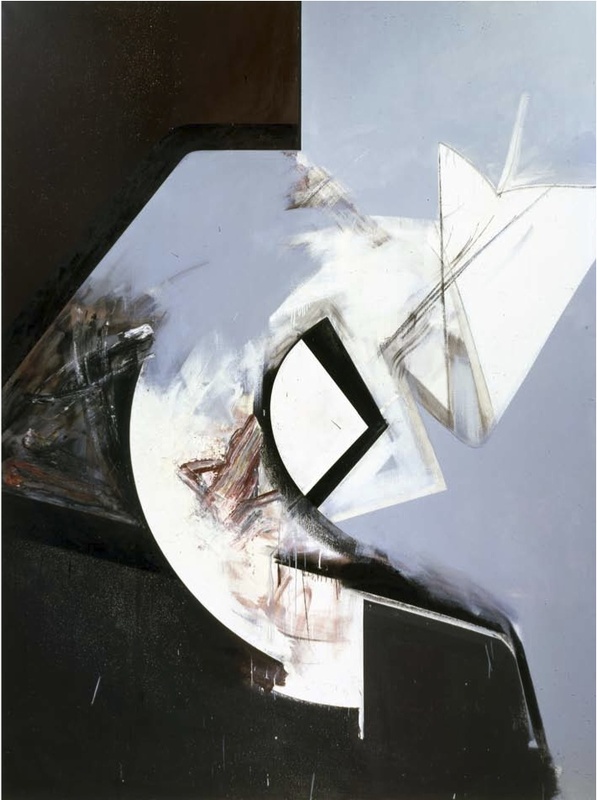 “Baja“ (1985) clearly refers to a series of preliminary drawings that possess a characteristic formal quality resulting from DeFeo’s distinctive technique. Using various means, such as the ubiquitous eraser in the “Triangle“ series of the early 1980s or the much-used adhesive tape, DeFeo created striking lines and divisions. Within this structure, an arc isolated in white at its center becomes a pivotal element. Like dancers, parts of this basic form spread out across the ground, hinting at DeFeo’s love of modern jazz. Since the works of American painter Carroll Dunham came to the attention of a broader public some three decades ago, they have passed through various formal processes. Following his early works painted straight onto wood, in which Dunham developed a basic vocabulary using the existing grain of the support, creating mainly abstract compositions in bold colors, in the late 1980s he transferred this development to paper. Finally, the amorphous forms gave way to comic- like figures, sometimes recalling the graphic style of Philip Guston, characterized above all by their distinctive outlines. Around 2000, a male figure in a dark suit became the main protagonist of these scenes: his nose a phallus-like object (something already hinted at in earlier works), he often carries a pistol in his outstretched hand. The two works on show feature the principle motifs of recent years: the former dominance of the aggressive male figure is broken by the arrival in the frame of a “sun worshipper,” mostly accompanied by lush vegetation. But the surroundings have changed once again. Whereas before, the sun shone brightly, the scene is now lit by a full moon in a dark night sky. The fallen tree in the foreground is continued almost seamlessly in the second work. The heavy treetop, lying on its side, has a wild tangle of branches and leaves, faintly echoing the early amorphous works of the 1980s. Norwegian artist Matias Faldbakken is known internationally for his direct, provocative, and radical position. In his work, he addresses social conventions and confronts popular culture with an anti-gesture that blends refusal and destruction with forms of chaos and vandalism. The media and products brought forth by societies whose ordering systems they also help to shape serve the artist both as a conceptual springboard and as an artistic tool. While using everyday materials and cultural artifacts like newspapers, magazines, television, video, and the Internet, as well as spray paint, adhesive tape, and marker pens, language often plays a central role in Faldbakken’s work. Text-based pieces are found throughout his oeuvre, as large-scale wall installations, works on canvas, drawings, prints, or graffiti, establishing the basic tone of a complex attitude of refusal. With “Remainder XVI“, Faldbakken is showing a work that develops in direct dialog with its setting. A certain segment of the wall of the exhibition space is tiled and then covered with graffiti by the artist. In the spirit of his oeuvre as a whole, graffiti becomes the central artistic gesture here, symbolizing the appropriation of ordinary everyday methods of provocation. The works of Swiss artist Urs Fischer are characterized almost exclusively by a very striking sculptural idiom. His drawings, large-scale installations, and huge, even monumental sculptures, all bear strong traces of the hands that formed them. 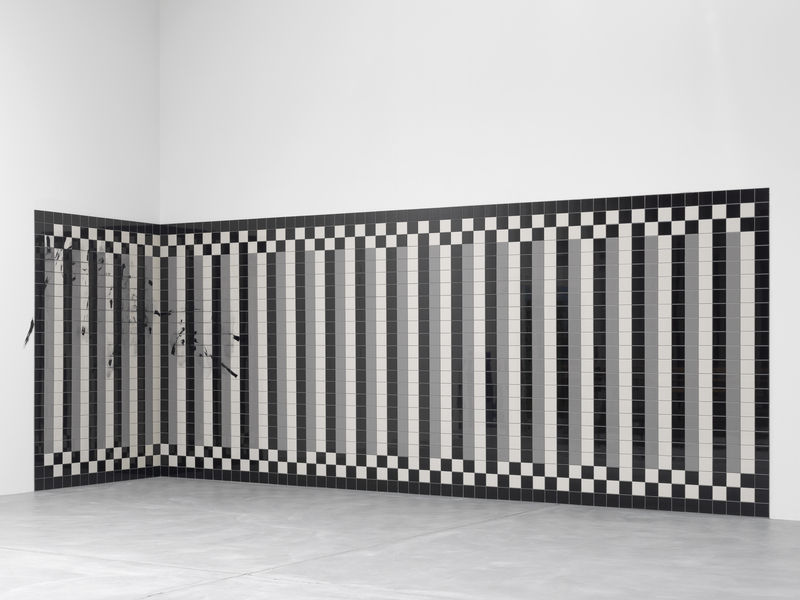 With his work, Fischer sounds out the possibilities of space and scale, of various materials and peculiar combinations. His motifs are drawn from many fields. He may focus on classical art-historical genres such as still life, portrait, or interior scenes, while other works revolve self-referentially around his own microcosm whose limits he permanently tries to broaden and undermine, as in his colossal “Big Clays“. In the “Panel Paintings“ of recent years, Fischer combines seemingly unconnected motifs in unusual ways. Large-format photographic prints of portraits of more or less famous movie stars from the black-and-white era are overlaid with pictures of objects such as nails or fruit and vegetables, applied over the photographs by screen printing. This creates an enigmatic interweaving of different visual systems and their respective representative qualities. The Briton Douglas Gordon is among the most influential artists of his generation. He came to prominence with his large- format video installations, the most important certainly being “24 Hour Psycho“ (1993) and the monumental “Play dead, real time“ (2003). With these works, he aims to expose the audience’s habitual ways of seeing, analyzing and fundamentally changing them. He has also worked with photography, texts, sculptures, and sound installations. Less well known are his paintings, which although few in number play an interesting role within his oeuvre as a whole. In 1993, the year he made “24 Hour Psycho“, Gordon made a number of paintings whose sole pictorial content is the titles and dates of existing paintings by other artists against a monochrome greenish ground. His interest in painting here focuses less on the physical, material act itself and more on the potential for confusion in the relationship between artistic intention and the viewer’s interpretation. In this work, Gordon assumes that conceptual painting, too, is capable of breaking down classical chains of association. Even without specific knowledge of what is referred to in the pictures, the viewer is offered other possibilities. With the “Holiday Paintings“, Gordon cites found film and photographic material in paintings that open up multiple points of reference. Gordon is interested in painting as a medium on account of its finality, the idea of a statement which, in formal terms at least, is pursued to a certain end point and then left to itself. 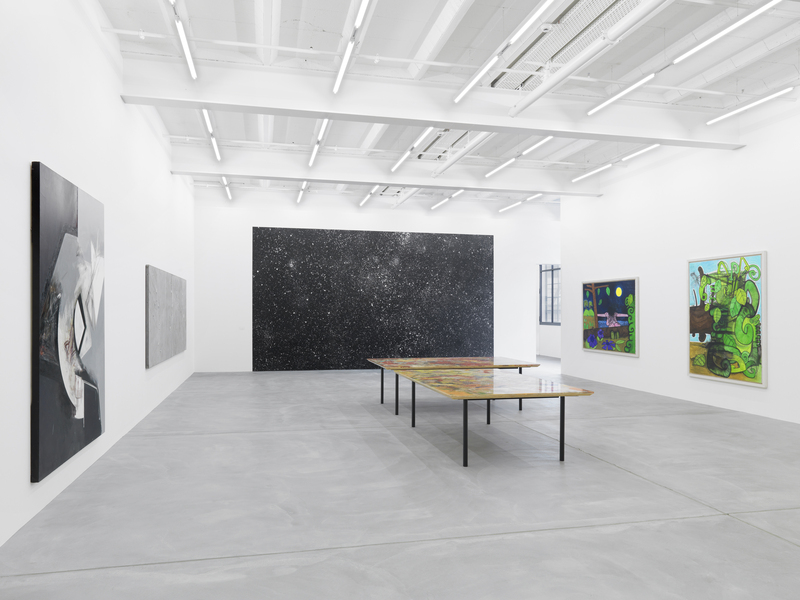 In the work of American artist Alex Hubbard, painting is often the central theme and the focus of a critical engagement that was initially based mainly on the film medium. Central works such as his three-part video “The Collapse of the Expanded Field“ (2007) and the subsequent “Weekend Pass“ literally revolve around actions arranged as performance: one after the other, various objects are presented, piled up and interlocked, often color-equalized either by emptying a bucket of paint over everything or with a uniform layer from a spray can. At the same time, there is more to these works than any final state they might achieve: once an action begins, it derives its true quality precisely from constant change. 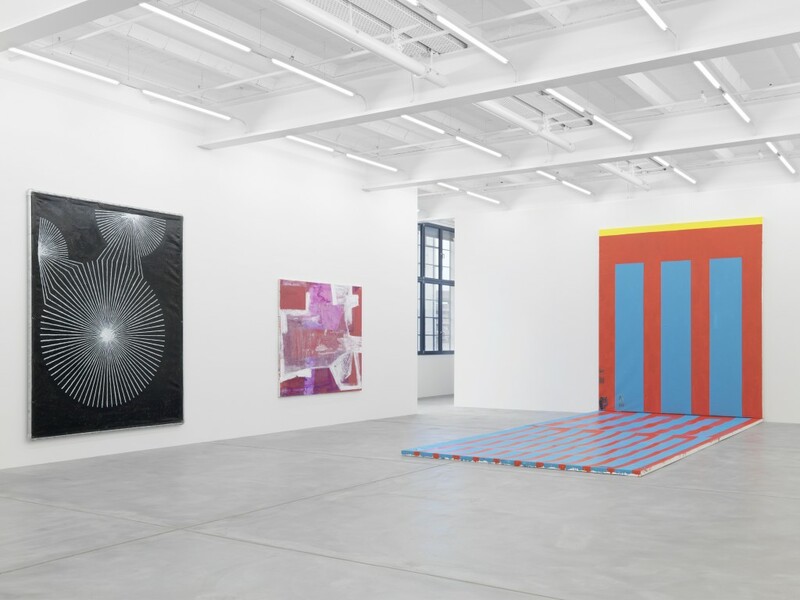 In this light, it is all the more astonishing that Hubbard nonetheless often returns to the format of painting in the classical sense of a two-dimensional pictorial space. It should be noted, however, that the principle of “anything goes” has top priority in this work. 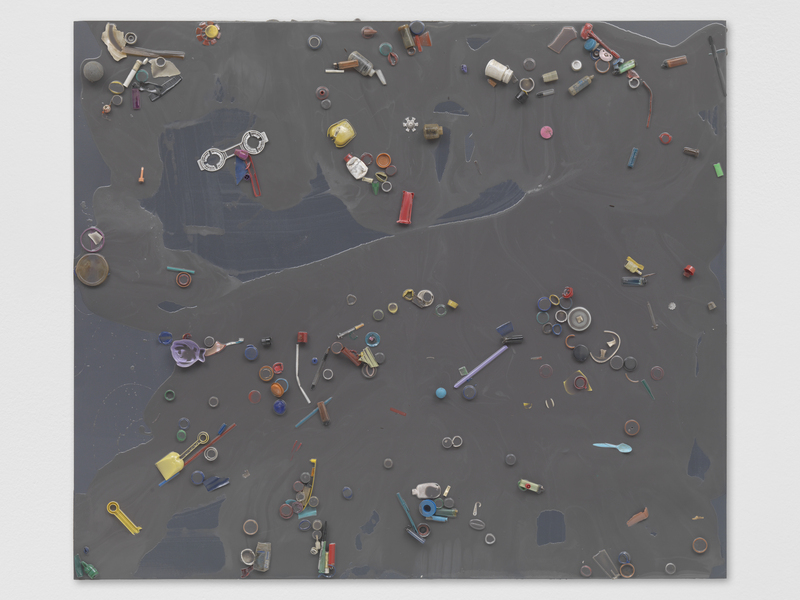 His pictures may combine anything at all: objects attached to the surface, large blobs of paint seemingly holding and binding them together, or a screen print used as the support. The construction of the pictorial space and the way it was made are always visible and decipherable, thus reflecting Hubbard’s idea of constant motion and change. With her obsessive oeuvre, Karen Kilimnik has been evoking a world saturated by seemingly trivial desires and longings since her early years. The glamor of fashion serves just as much as a means of projection as do TV series, the rainbow press, or the world of ballet: hovering students, dying swans, or dead squirrels are suitable protagonists for her art, which is filled with girls’ dreams. In her drawings, Karen Kilimnik combines beauties traced from magazines with lifted quotations, and her own, sometimes quite caustic comments. Her oil paintings, by contrast, appear rather traditional, except that they tell of a sense of tradition that the artist does not derive from her reflection on the art of the past, but from the popularized repertoire of the media industry. 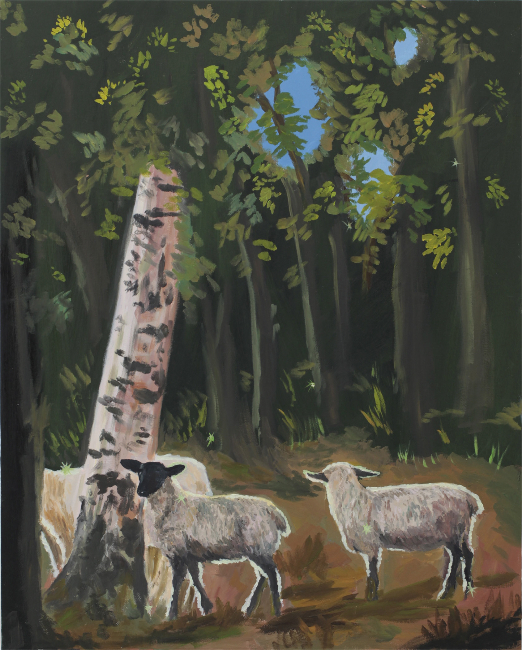 While producing her paintings, Karen Kilimnik appropriates seemingly romantic landscapes, castles, and pedigree dogs. No less memorable are her sensitive photographs, which show sceneries from Central Park, landscapes, or shop windows. What makes them sensational is the fact that they spot the media fantasies that characterize Karen Kilimnik’s motifs outside the realm of fiction, within a, as it seems, authentic reality. The American artist has left her mark on art history both with her way of taking pictures and her succinct, obsessive installations: She uses striking props and open-mindedly assembles finds, cheap decoration material, and luxury furnishings to form powerful images. Born in Washington in 1954, and a resident of New York for the past 25 years, Chris Martin came to prominence in the 1980s. For thirty years now, he has been working tirelessly on his sometimes very large-format pictures, making use of every conceivable material. Some are employed to experimental ends, as when Martin covers the canvas in slices of toast before “plastifying” them with a thick layer of acrylic paint. Other objects, like the vinyl records that appear in large numbers, tell a very different story of influences and role models that he often quotes, describes, and venerates. In formal terms, almost all of Martin’s works engage with abstract painting, drawing with great skill on all of its historical and contemporary currents. 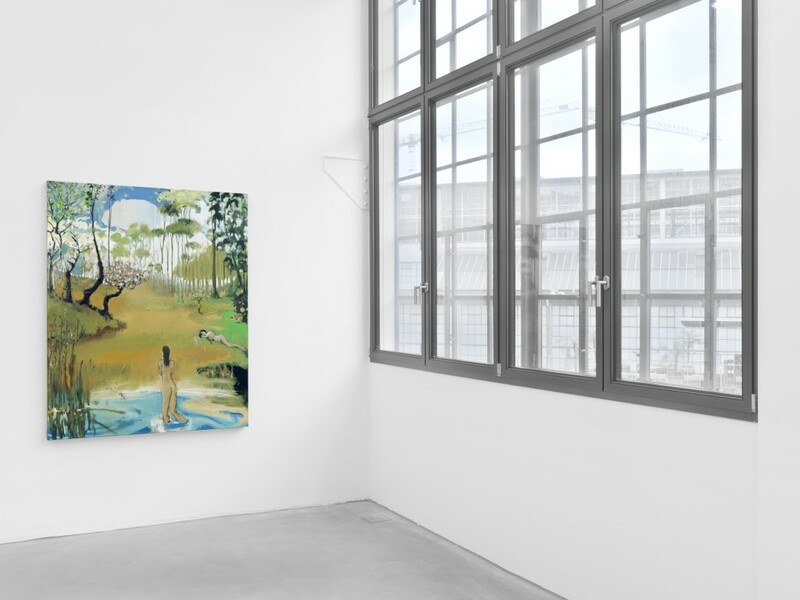 “Staring Into The Sun“ was part of Martin’s 2011 exhibition at Düsseldorf’s Kunsthalle. During preparations for this show (but also on previous occasions) Martin moved his studio onto the roof and worked in the open air on sometimes gigantic canvases. These works painted flat on the ground were later installed on the outer façade of the Kunsthalle, while others, including “Staring Into The Sun“, were installed in such a way as to transform the floor and the adjacent wall into a stage- like space resembling a landscape. In the early 1980s in New York’s South Bronx, a group of young people formed around Tim Rollins as a socially motivated project, and it wasn’t long before they began creating works that made use of the materials that were to hand. Initially this meant bricks from demolished buildings in the neighborhood, but educational materials such as texts, brochures, and books soon became and have remained the central element of the group’s work, right up to the current exhibition. Highly politicized, and appalled at conditions in the Bronx, Rollins developed a unique study group and later artists’ collective, the Kids of Survival, that has reinvented itself more than once over the past 30 years. 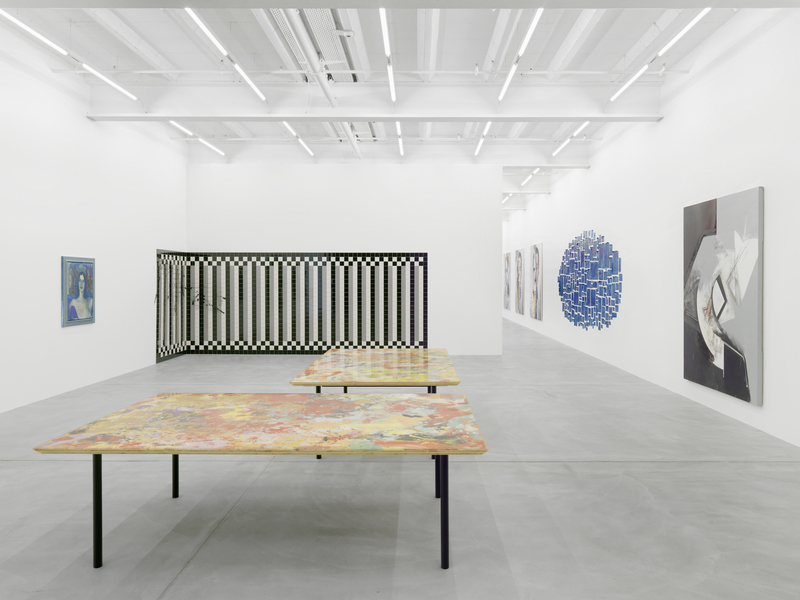 Ugo Rondinone’s oeuvre is extremely diverse, including photography, video, installations, painting, sculpture, and drawings. This range of artistic media permits a constant formulation and rewriting of the artist’s thoughtful, poetic world. Often described as a romantic, he addresses issues of time, ephemerality, and the relationship between reality and dream. These themes of temporality are also found in his works of recent years, as in the aluminum casts of ancient olive trees from which time is removed by this transformation, giving them a distinctive new presence. Other works like his closed wooden doors and windows—a motif approached by the artist in various media—convey an ambivalent feeling of hopelessness, both oppressive and beguiling. 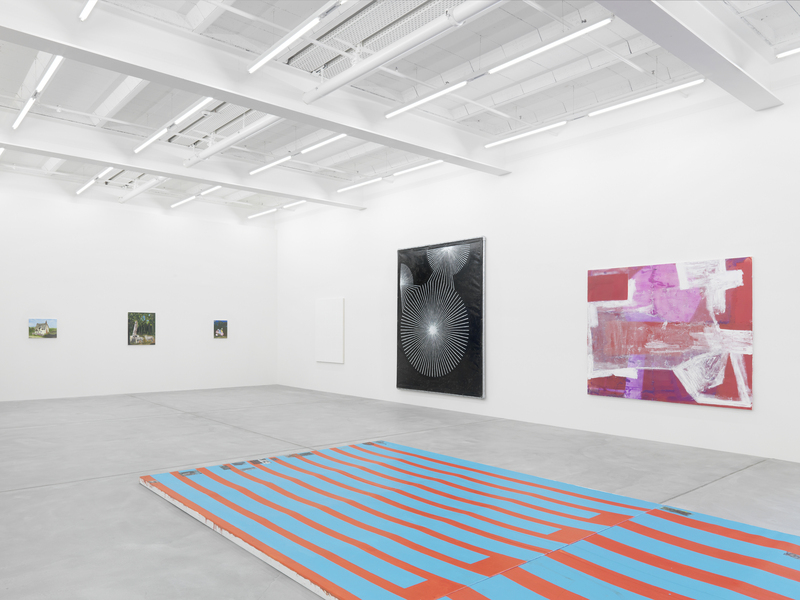 Like his landscapes and his circle and stripe pictures, the star pictures with their titles naming a specific date belong to the group of journal-like works within the artist’s oeuvre. Thanks to this precise pinpointing in time, the viewing experience comes very close to a contemplative snapshot. Whereas the landscape drawings give one the impression of being spirited away to a romantically idealized situation, the star pictures open up a view of the infinite night sky that is full of longing, but that always also resonates with the possibility of failure or imperfection. Steven Shearer’s works revolve around similar issues in constantly changing forms. His central interest here is a youth subculture committed to heavy metal that first emerged in the 1970s. 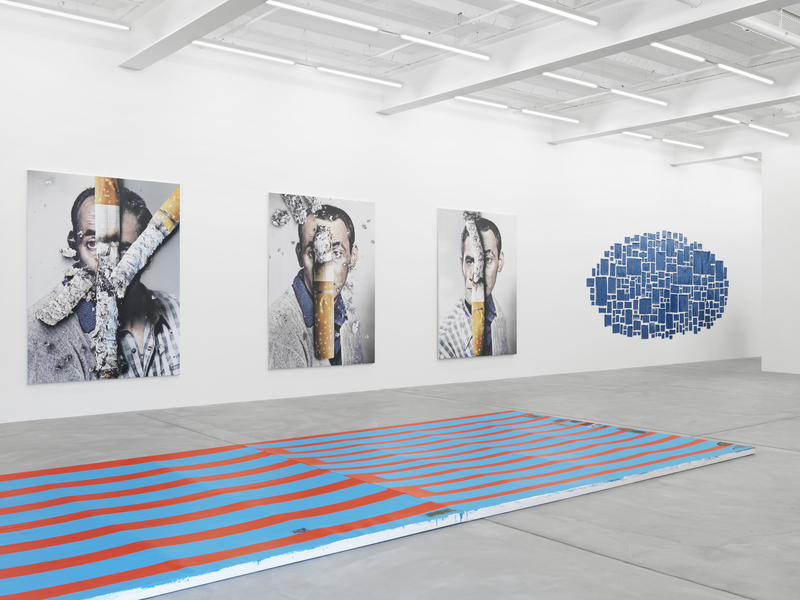 In this work, Shearer uses products generated by this mass movement, such as merchandise, while also addressing the personal self-portrayal. With an almost archival ambition, Steven Shearer is constantly enlarging his private atlas of images., which he then removes from the immense mass of collective image multiplication. In a further step, Shearer responds and reacts to this collection on several media levels. Using the techniques of classical painting, drawing, simple photocopies, or computer- based image editing, the works all possess a great melancholic quality. “Graceful Ghost“, a work first seen at last year’s Venice Biennale, shows a member of this heavy metal community. 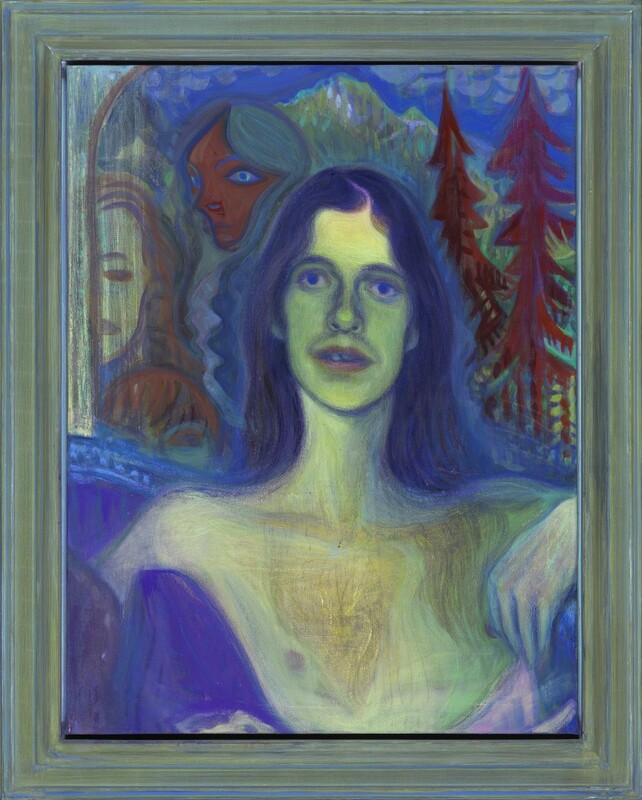 Taken out of his everyday context, the bare-chested figure is placed against a background recalling late works by Ernst Ludwig Kirchner, creating a bridge between times and genres. The place to which Kirchner fled from the chaos of city life is also recommended by Shearer to his hero as a place of refuge, pursued by dark but enraptured visions. Josh Smith came to prominence with the “Name Paintings“ that feature his own name in a succession of variations as their central motif—a reflection on the search for a distinctive artistic identity. This very common name is thus not content but the occasion for a painterly praxis that delights in experiment, trying out a plethora of styles and thus—in spite of, or precisely because of its explicit hand-written quality—rendering absurd any idea of a unique identity. In his “Collages“, too, where found materials such as newspaper clippings or takeaway menus are combined with his own drawings, posters, and objects from his studio, he takes aim at the myth of artistic authenticity. The works in the exhibition are all constructed on this collage-like basis, but have been reworked to a greater or lesser degree using paint. Drawing on his now firmly established formal repertoire, Smith’s initials often shine through, large leaves impose themselves on the ground, flanked by abstract compositions. With his “Adaptives“, Franz West first formulated a characteristic that laid the foundations for his future work. Rather than trying to create an autonomous and closed artistic work, the viewer and user would complete the work with his/her acts. In this spirit, West once said: “The death of the author has been a theme since the time of Pericles. Being a sculptor then meant that ideas flowed through the individual. They were passive instruments that served to create sculpture.” His first furniture pieces emerged as a logical continuation of these ideas, making it easier for the viewer to find a way of approaching the works. While they could actually be used as objects in private space, in an institutional context they took on a puzzling status: are they art or furniture? The “Aspic Tables” on show in the exhibition emerge from everyday work processes in the artist’s studio. 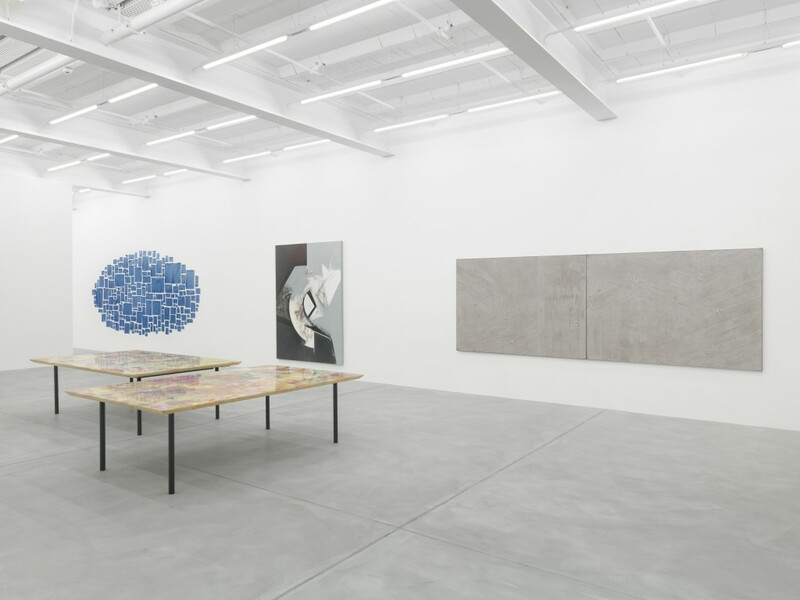 Over time, the tabletops installed there as workspaces acquire their typical picture-like surfaces recalling Abstract Expressionist compositions. All the various marks left by paint tins, drips of paint from sculptural works, and other material traces are finally sealed under many thin layers of epoxy resin, creating the characteristic aspic-like appearance. Sue Williams has lived and worked in New York since the mid-1980s. In her early career, she became known to a wider audience with her highly narrative painting. In taboo-like visual stories that seem like comics and caricatures, scenes of domestic violence and sexual obscenity, the artist expresses her rage over the enduring acceptance of sexism in society. Unlike many of her contemporaries, who in confronting the classically male dominated medium of painting turned to other modes of expression such as film, photography, or installation, Sue Williams remained committed to her familiar terrain. It is precisely this monopolistic aspect that allowed Sue Williams to play with the often conventional and stereotypical representations of her male colleagues and massively exaggerate them in her own visual space. While she first worked in a style that was highly narrative and figurative, formally similar to caricature, this changed quite dramatically in the mid-1990s. The text that often accompanied the earlier works now disappears completely from the images, and the depictions of violent sexual acts, once explicitly presented, are here fragmented across the entire image. Sue William’s painting has constantly moved along a narrow line between figurative depiction and complete abstraction, as happens in some works in the early 2000s, in which the targeted monochromatic brushstroke becomes a central element. In her new works, these two realms are mixed anew, and Sue Williams thus explores an entirely new way of working.